Small Business Tracker Deluxe is a productivity suite that allows self-employed professionals or small businesses to keep track of their time expenses contacts appointments schedules invoices passwords products supplies and even inventory. It can be used for any number of products or projects and easily generates reports and invoices for printing or exporting. Users can set preferences for date and time formats currency symbols colors and more. *** Small Business Tracker Deluxe includes: * Activity and Expense Tracker - Personalized time management tool. * Invoice Tracker - Details how much is still owed and by whom. * Inventory Tracker - Records purchases and sales and generates detailed reports. * Invoice Creator - Create Invoices from products in Inventory Tracker and customers in Contact Tracker. * Expense Tracker - Track tax deductible expenses checking accounts print checks and create tax form reports. * Other Income Tracker - Record income from a variety of sources. * Password Tracker - Collects valuable passwords in one easy-to-access place. * Contact Tracker - send form letters to clients and vendors. * Schedule Tracker - Appointment tool helps create printable schedules. * Task Tracker - A handy To Do List generator. * Vehicle Expense Tracker - Allows users to easily and accurately record data for tax purposes. * Version Tracker - Keeps track of changes between document versions. * Writers Helper - Quickly creates drafts of letters articles etc. 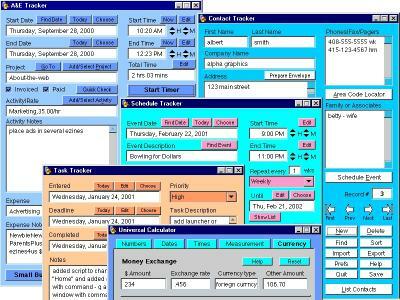 * Universal Calculator - Computes numbers dates times measurements and currency conversions. *** A Guided Tour is included. * Get FREE Customer Support if you need it. * Users can set preferences for date and time formats currency symbol colors and more. * Small Business Tracker Deluxe runs on and shares data between most computers including Windows 7VistaNTXP and Macintosh OSX operating systems but will NOT run in a shared environment on a server.